If you continue extending the analogy, most of us who fish aren’t doing it to catch the big fish. That might be in the back of our minds, but we do it because we enjoy fishing. There are long periods of solitude where we might not catch anything. But then you mix in periods of interacting with others fishing on the lake. You exchange ideas about what’s working, where the fish are biting, but in the end, it’s up to you to make your own decisions. If you’re going to enjoy fishing, you need to enjoy the process, not just catching a big fish. It really is the same with blogging. This marks the 100th post on Financial Slacker and about six months of actively working on the site. Before going public in April, I had worked on the site intermittently posting articles now and then over the prior five months. But since April, I have mostly posted anywhere from two articles per week up to an article per day over the past few weeks. And while much of what I’ve written has probably only been read by a handful of people, there is the occasional article that gets a bunch more reads. It’s fun to see a big day of page views and visitors. But it’s also fun just to write the articles. The research, the thinking, the writing is all a part of the process. Writing on this site has changed how I look at money. It’s created a certain amount of accountability and opened doors that I never knew existed. Since I started writing on this site, I have made a number of positive financial lifestyle changes from reigning in expenses that had creeped up over the years to taking control of our investment portfolio. And during this time, I launched a private financial consulting business and even made a little money on the site itself. And now I’m exploring opportunities to start a new business or possibly acquire an existing business. These are all things that I probably wouldn’t be doing if I was still working in the corporate world and hadn’t started this site. These last six months have gone by pretty quickly. And while there is still plenty more to do, I am going to take the advice of all you readers who told me to stop and appreciate all that I had accomplished. Last year, at this time, I never would have thought that I would have a website up and running with 100 articles and over 100,000 words posted. I am pleased to have made it this far and I’m looking forward to the next 100 posts in the near future. Readers, is there anything you started without knowing how it would turn out? What was your motivation? When times got tough, what did you do to keep going? Congratz on this milestone…! Great to read that the blog is giving you good energy and positive results. Thanks, ATL. I appreciate your support. I’ve found that the more I write, the more energy I get from the site. It’s a positive reinforcement circle. The more I invest, the more I get back. Thanks, Stefan. I appreciate your support. It’s great that you’re already seeing that impact in your life. I can’t wait to read about how things change once you start working. Looking forward to the next 100 posts. Nice job on the 100th post! I always enjoy reading what you have to say! Thanks, Jim. I appreciate the support. It’s been fun getting to 100. Can’t wait to see what comes next. I’m feeling a surge of energy around the site. There are so many things that I want to do and write about. Definitely feels like I’m just getting started. Congratulations on the achievement FS, you’ve been really active posting recently. Keep it up, you’re doing really well. Thanks, Tristan. I appreciate your support. It’s funny, I’ve been posting something everyday and I’m finding that works well. Sometimes the posts are short, but it’s keeping me more aware of things going on around me. nice milestone. I am not there yet and I find it hard to keep up every week with posts. 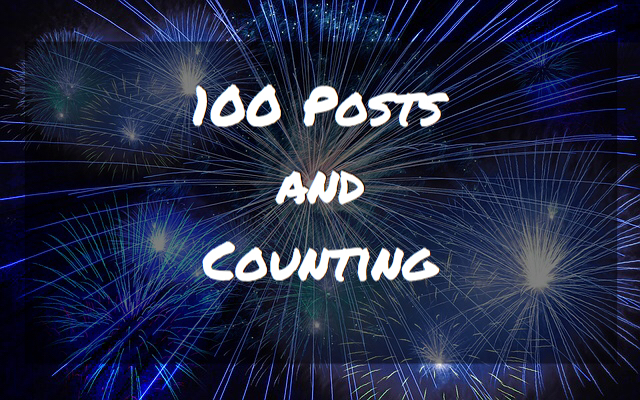 I think 100 posts is a great accomplishment . Keep it going Kudos ! Sorry I’m slow to respond. Your comment got caught in the spam filter for some reason. I’ve definitely had times when I couldn’t decide what to write about. Often it was because I wanted to write something in-depth on a topic, but didn’t have the time to do enough research. But it blocked me from coming up with other ideas. For me, writing more often is helping. It takes the pressure off. When I wrote less frequently, I felt that each post had to be perfect. Now I realize that no post is perfect and I’m just writing what’s on my mind that day. But it does take quite a bit of time.